Among the perks of frequent flying, an unfortunate last position can be easily claimed by the “missing the connecting flight” events. Especially with short connections and late departures for the first flight of the journey. Then you get to talk to the [most of the time] nice and professional people from the Service Desks (I’ve seen some not so nice, luckily I did not have to deal with them) where you can even get a laugh, since they are just the ones trying to help you, without being in control of what’s happening elsewhere. Which is what happened to me today. As if the day was not fun enough in the beginning (I got an SMS that my flight has been canceled, to find out later – upon calling the Customer Service hotline of Austrian Airlines – that there’s no crew for that flight… For crying out loud, people, I can fly your planes, just let me try! :D) I got the unwanted bonus of a delayed departure of my re-routed journey. Of course, if everything went smooth I could have caught the connection… but then you wouldn’t be reading this post. So, what could someone do for almost FIVE hours in an airport? Airports are known to be far and out of the cities, so by the time you get to the ciry you should be back at the airport. No lounge access either, for various reasons (like flying Economy + no frequent flyer benefits for that airline). Munich is a decent airport, but not necessarily spectacular… Wait a minute, a while ago I heard about iPILOT and that they do have a 737 sim in Munich… HOLY F**K! The only downside is that the sim is located in the Arrivals area, so you have to go through the passport control (and then again when you get to the Departures area, plus one more Security check). To hell with it, we’re talking about a FLIGHT SIM where you’re accompanied by a REAL PILOT. 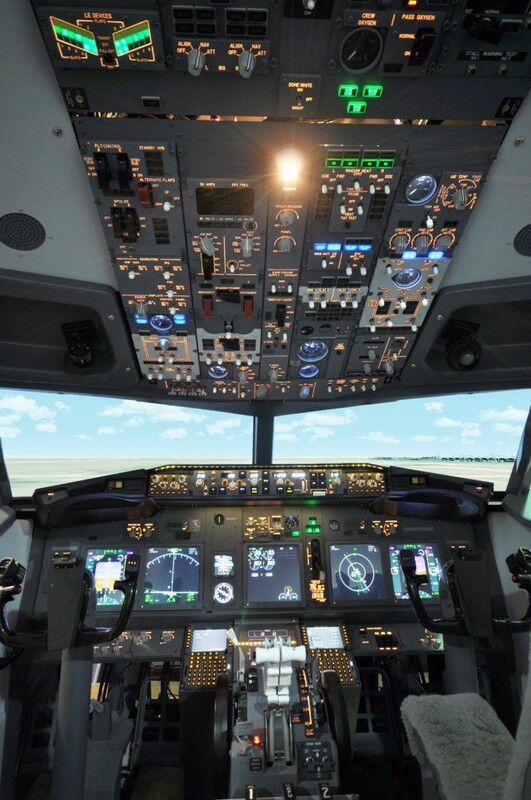 Ok, not the uber professional sims used to train and test the pilots (one such sim is a few million bucks/EURs) but the flight deck is fully operational and the controls are… complete. Mkay, features – checked, muniez – hmmm, not much, but checked too. Aaaand aside from what you can find on the site, there’s an “on the spot” 10 minutes fly for 25 €. Not cheap, mind you – you can get 15 minutes of real flying in an ultra light plane in Romania, only you do NOT fly it – but the combination of 737 fully functional flight deck + fully realistic flying experience together with an airline licensed (or soon to be licensed) pilot is worth it. So, departure. Got a very nice explanation about the VORs and DMEs used for the departing route (each airport has a DEPARTURE map and an APPROACH map, with the paths clearly marked and described; maps are commercially available from various vendors), then, after a brief checklist was completed I proceeded from the apex of the departing runway all the way to the long ascending path towards the main direction. I managed to keep the plane on the runway and even to keep it reasonably within the required parameters (speed / altitude / bank – all of them are mandatory during the departure and approach phases). All on manual, they did NOT let me use the autopilot (“I want to see how YOU do it, not how the computer does it because THAT I know!” :D). Apparently happy with my performance, he then set me 15 nm from the runway, with a bit of crosswind (a few knots, but enough to feel it and to require a bit of rudder…) and, after all pre-landing checks performed, to the runway we go. This time not from the ground but from the air. Few people have an idea about how SMALL that runway is, even at a close range of 15 nm (1 nm = 1 nautical mile = 1 meridian minute of arc = 1852 meters for those unfamiliar with planes or ships) and how difficult it is to find and keep the glideslope. The glideslope is an electronic signal transmitted by the associated ILS which the plane has to follow in order to ensure that the runway is reached at optimum parameters (angle of descent, distance from the apex and so on). To my credit, even if a bit rusty – it’s more than 8 years since I flew a realistic flight sim – I managed to intercept the glideslope by the book (from below 😉 ) and to keep it quite well despite the crosswind. Even if I did flare a bit too much, being unused to the perspective, I put the plane down safely and managed to pull to a complete stop also by the book. This attracted the commendation of the observer (not sure whether he was the supervising pilot or not). All in all, I strongly recommend the experience if you have the chance to pass through one of the airports where flyipilot has a sim. Too bad, unfortunately, that their German website is only in German – but you can check their UK site too or, if you trave through Prague, the Czech site. UPDATE (30 Nov. 2015): it is with great sadness that I must inform my readers that the sim is no longer in the Munich airport, Terminal 2. It has been moved somewhere in the city center. I do not know the exact address at this time but I will try to get it. Travel insurance? Yes, a must! Wow! It must have been an awesome experience. I don’t have the guts to try and fly a plane, not ever. Flying a plane was one of my fondest dreams when I was a kid. Of course, now, I’m content to fly one. No need for me to sit in the cockpit, thank you, but I’d be delighted to try a sim! Delayed or missed flights, a curse for all travelers. But you handled it infinitely better than most. This sounds really interesting and makes me wanna try doing it too! Flying a plane is the greatest fear I have inside of me. The heights makes me tremble with fear even in the building. Lucky for you that flying a plane is awesome. Always wanted to get the chance to fly a plane. I think its great that you managed to cross that off your bucket list. SO COOL! It’s awesome that you had a hand at “flying” a 737… a good way to experience what it feels like to be behind the wheel without any dire consequences. Indeed so. Too bad they don’t have one of the BIG, professional machines… but I guess that would have been some 10x more expensive. This is AWESOME! What a great way to handle a delayed flight! Erica´s last blog post ..Where Are The Elephants In Goa Gajah? Worth trying, if you’re a flying afficionado. I don’t really get what you are trying to say. So you were flying a 737? So meaning you are a pilot or have a pilot license? ooooh. i wish i could do just the same. <3 you must have enjoyed it a lot. I’m sure they are not the only ones throughout the world to have such features. But if you come to one of the airports where they have such sims, you could give it a try. I’m scared of heights, ultimately high places. So being able to fly a 737, let alone any plane never appealed to me haha. Unless it’s for a game. This is great though, my husband would learn love this! From a certain standpoint, flying is boring. But it can be challenging at times as well. I’m not sure how much the entire setup costs, though; on their UK website they are selling a heli build for 49 thousand pounds. Next time I’ll ask the guys! Panicking? No, not really. But there’s a lot to do in there during a flight, and even keeping track of all communication to the ground can be exhausting. This is quite easy for short- and medium-courier flights, but the long ones – especially over ground or crowded airspaces – can be challenging. Wow ! My goodness for me this will be like one in a lifetime if i could get to experience it. YOu must have had a brilliant time. ahhh came just in time! I will be flying to Germany and Austria in December through Munich – nice to know there’s actually a cool attraction to check out right at the airport. Thanks! Make sure you get to Terminal 2 – ARRIVALS in Munich. If you plan to stop there on departure, be careful because the security check queues take a bit of time (10-20 min depending on the daytime). I have a pilot friend who happens to be flying a Phil. LA route . He once told me if I do like to try to be his co-pilot. I told him, Why not? If you can handle the stuff, I don’t see why not either. Just be aware that you’ll be in charge of the lives of all people on board that machine. Flying with a simulator is a great way to pass the time at the airport. It looks really fun and educational. For me it was 99,9% fun, the education took place before this. This is a bit technical for me but i enjoyed reading it too. Being a pilot is not an easy job. It comes with huge responsibility to ensure the passangers reached their destination safely. I like to travel but don’t like to be on flight for long hours. Luckily for me flying around Europe is no longer than 4 hours, which is bearable. Farther destinations (southern Africa, Americas, Asia) are significantly more demanding, it’s true. One of my fantasies. And now I’m wondering if it will ever happen in my lifetime. But who knows? Ahhhh! I can’t wait for that time to come for me to also experience this! 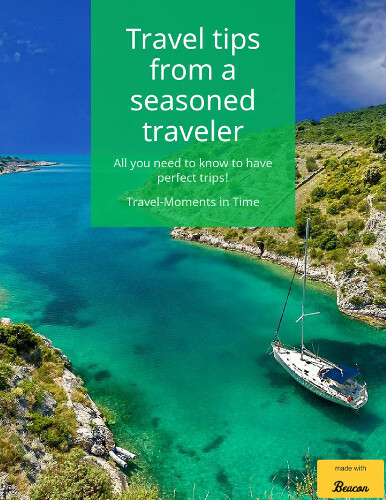 Raymond´s last blog post ..1st International Solo Travel. Top Things To Do (I did) in Singapore & Indonesia! Don’t delay. Go for your wishes and goals, or you may find out that it’s too late… 🙁 I wish I found this a few years ago… but even now it’s ok, I’ll still have many chances to stop by in the future. You are very brave to fly a plane. I am scared to even get on one these days. With all those controls leave it to me to press the wrong button! Can you fly this simulation even without any experience whatsoever? This is indeed a very interesting activity to do. Everyone I think would like to simulate flying a plane. Wow. I might put this on my bucket list. I’m sure it takes a lot of training and experience to know this.